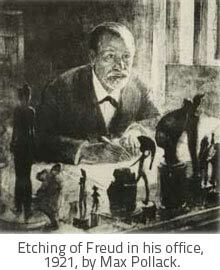 The Sigmund Freud Collection was presented to the Cleveland Medical Library Association by Robert M. Stecher, M.D. on the eve of the Centennial celebration of Freud’s birth. It was his intention that the library should have original editions of Freud in German and English, including “semi-fugitive material which escapes collection and is lost forever.” He continued to add to the collection until his death in 1972. Ten years later Dr. David Crocker and the Cleveland Psychoanalytic Institute added their own collections of historic works in psychoanalysis and psychiatry, bringing the total number of volumes to well over five hundred. Some of the highlights are discussed below. John Stuart MILL (1806-1873) Ueber Frauenemancipation. Plato. Arbeiterfrage. Socialismus. Uebersetzt von Sigmund Freud. Leipzig, Fue’s Verlag (R. Reisland), 1880. Sigmund FREUD (1856-1939) Zur Auffassung der Aphasien, eine Kritische Studie. Leipzig und Wien, Franz Deuticke, 1891. This is Freud’s first book. In it he criticizes the findings of Carl Wernicke and Ludwig Lichtheim on aphasia. Eight hundred and fifty copies were printed; two hundred and fifty-seven were sold. After nine years the remainder was pulped. For this reason it has become one of the rarest books in Freudian literature. Sigmund FREUD (1856-1939) Die Traumdeutung. Leipzig und Wien, Franz Deuticke, 1900.